The three member crew of Shenzhou-10 docked with the Tiangong-1 space module at 05:11 UTC on Thursday, marking the start of 12 days of docked operations. The arrival of the Chinese spacecraft occurred without the fanfare of previous missions, with no live coverage and just one official line of success from China. Following Tuesday’s successful launch, Shenzhou-10 – and its three taikonauts – were inserted into a parking orbit. With the spacecraft using its own propulsion system, its orbital parameters were raised to a near circular orbit with an altitude of 330 km. The spacecraft took two days to transition into rendezvous operations with Tiangong-1, leading to one of the main pre-docking tasks – the fly around maneuver. 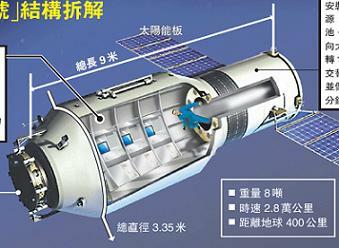 During Shenzhou-8 and Shenzhou-9, the rendezvous was conducted via the V-bar approach. 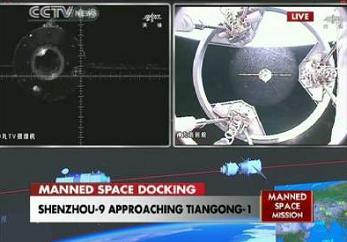 For Shenzhou-10, Chinese space specialists noted one of the main goals was to try to approach the station on the R-bar, and then maneuver to the docking port. This change to rendezvous is a key docking objective ahead of the construction of the future modular space station China plans to operate in 2020. With China deciding to not to webcast the docking, there is no way to know if the R-bar approach was taken, or if they continued to use the V-bar approach for this mission. For rendezvous and docking, operations began at a distance of 52 km from the space module with the monitoring center system analyzing the parameters of Shenzhou-10. At this distance both spacecraft will have been able to read the relative position and velocity of each other. The next phase began when the two vehicles were 20 km apart, as Shenzhou-10 moved towards the three Go/No Go points – at 5 km, 400m and 140m. During these – as the Chinese call them – “parking points” the relative position of the spacecraft were assessed by ground controllers before a go to proceed was given. 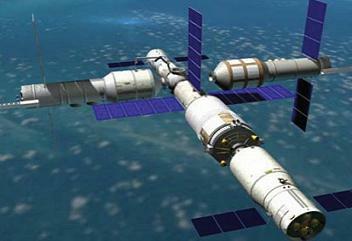 During these operations, Shenzhou-10 provided the role of the “active vehicle”, while the Tiangong-1 acted as the “passive vehicle”. As the distance between the two vehicles continued to close, the ground control data continued to increase in accuracy, allowing for the final approach and soft dock. It took 15 minutes to provide a hard dock/seal between the two vehicles, which allowed the control center to adjust the cabin environment. Upon entering the module, the crew began taking measurements into cabin pressure, oxygen capacity, air temperature and humidity, along with checks into potentially harmful gases. Docked operations with Tiangong-1 will last 12 days – with two of the taikonauts sleeping in the module, while the third will sleep on the Shenzhou-10, as was the case during Shenzhou-9. Onboard the Tiangong-1, there are two dedicated sleeping areas that are each equipped with two-way video communications equipment. Tiangong-1 is equipped with everything a taikonaut needs, including exercise equipment, medical laboratory equipment, waste recycling equipment, medical health monitoring equipment, among other essentials. Also on board are various clothing packages available for men and women, including thermal underwear, warm pants, sports shoes, sportswear and shorts. 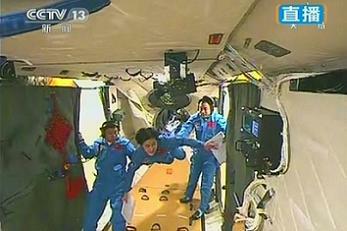 At launch, Shenzhou-10 itself carried more than 300 kg of cargo, including water, food rations and experiments with it to the module. While in orbit, medical examinations will be conducted, including on-orbit examinations of the crew’s hearts, lungs and biochemistry conditions, as well as providing effective prevention against space motion sickness. For this, equipment ranging from a bicycle ergometer to a chest developer and neuromuscular electrical stimulation have been prepared on board Tiangong-1 to protect the taikonauts against weightlessness and maintain their cardiac and muscular functions. While the medical impacts on the taikonauts will be the main focus of the mission, Shenzhou-10 will also mark a first for the Chinese, as the taikonauts will carry out youth-oriented science education activities during two space science lectures. (Images via CCTV and ChinaNews.cn).